In just a few minutes, you can quickly and easily publish your menus in Health-e Pro to your menu boards. Rather than spending tens of thousands of dollars, Menu Boards are INCLUDED with your Health-e Pro Premium Package. Quickly and easily display your menu items at Point of Sale for students to see all items being offered that day. Health-e Pro is introducing Menu Boards to its customers! With very simple hardware and just a few minutes of setup, you can display menus and meals in your schools with the same intuitive, seamless interface you’ve come to expect with Health-e Pro! Syncing directly with your published menus, you can publish to your digital menu board cards quickly and easily when paired with digital signage software. We provide a list of recommended hardware and easy-to-use software to get you started–and at an affordable price! Add a menu, images and cards all within a matter of minutes with an easy-to-navigate interface that links directly to Health-e Pro. Any last-minute changes to a menu in Health-e Meal Planner can be synced easily to your digital menu boards. Pick and choose which menu items you want to display on your Menu Boards, from snacks, to meals, and everything in between! 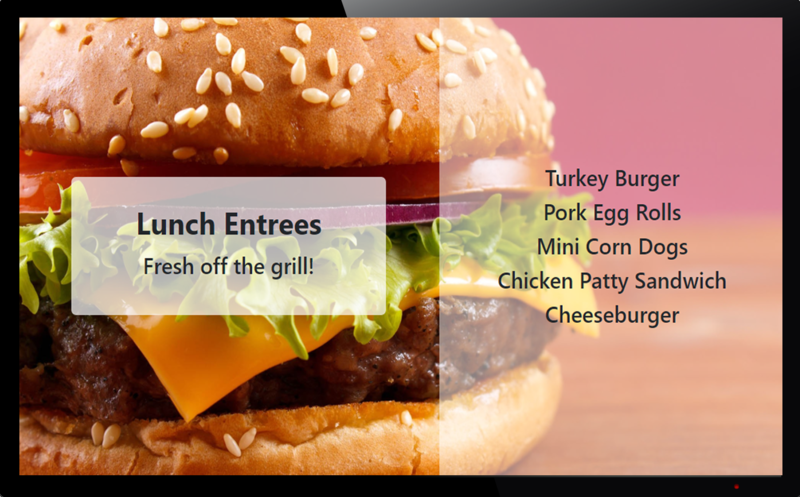 With preloaded images to choose from, you can make your digital menu boards fun! Using Health-e Meal Planner, plan your nutritious and compliant meals for your district. Within My School Menu Boards, create digital cards to present menus in your cafeteria. Using communications software, send your digital cards and menus seamlessly to a screen. Check out our Menu Boards FAQ page to learn even more about our new Menu Boards. We’ll tell you everything you need to do to get started using our exciting new software. Planning, publishing, and displaying your menus has never been so easy. Contact us to learn how you can get started with Digital Menu Boards.